Sixth-ranked Skikda (3-6) made lots of trouble for first ranked CRB Dar El-B. (8-1) in El-Beida on Tuesday. CRB Dar El-B. managed to secure only three-point victory 75-72. However their fans expected much easier game. CRB Dar El-B. maintains first place with 8-1 record. Skikda at the other side dropped to the seventh position with six games lost. Very important is a road loss of second ranked Arreridj (6-3) against sixth ranked El Eulma (4-5) on Tuesday night. Visiting Arreridj was defeated by El Eulma in Eleulma 66-54. It ended at the same time the six-game winning streak of Arreridj. El Eulma moved-up to fifth place, which they share with Olympic Batna. Arreridj at the other side keeps the second position with three games lost. They share it with WA Boufarik and NAH Dey. Very important is a road loss of second ranked Constantine CSC (6-4) against seventh ranked Ouargla (4-6) on Tuesday night. Visiting Constantine CSC was crushed by Ouargla in 78-54. Ouargla moved-up to sixth place. Loser Constantine CSC dropped to the third position with four games lost. Very important is a road loss of third ranked WA Boufarik (6-3) against fourth ranked NAH Dey (6-3) on Tuesday night. Visiting WA Boufarik was defeated by NAH Dey in Alger 73-56. It ended at the same time the two-game winning streak of WA Boufarik. NAH Dey moved-up to second place, which they share with WA Boufarik and Arreridj. An exciting game between Top Four teams was played in Batna. Third ranked USS faced 4th placed Olympic Batna. Guests from Setif (7-4) defeated host Olympic Batna (4-5) 78-67. USS moved-up to second place. Olympic Batna lost third consecutive game. They dropped to the fifth position with five games lost. GS Petroliers crushed Oran in Alger 101-48. Olympi Miliana beat Constantine JP at home 86-73. Staoueli won against USM Blida on the opponent's court 76-67. 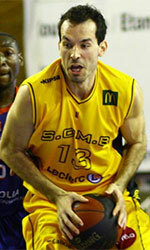 There was no surprise when bottom-ranked Oran (0-9) was crushed at home by leader GS Petroliers (9-0) 101-48 on Tuesday. GS Petroliers have an impressive series of seven victories in a row. Defending champion maintains first place with 9-0 record. Loser Oran still closes the standings with nine games lost. No shocking result in a game when fifth ranked Olympi Miliana (4-4) defeated at home 7th ranked Constantine JP (1-9) 86-73 on Tuesday. Olympi Miliana maintains fifth place with 4-4 record. Constantine JP lost sixth consecutive game. Newly promoted team keeps the seventh position with nine games lost. Rather expected game in Blida where 8th ranked USMB (2-8) was defeated by fifth ranked Staoueli (5-5) 76-67 on Tuesday. Staoueli have a solid series of three victories in a row. They moved-up to fourth place. Loser USMB keeps the eighth position with eight games lost.